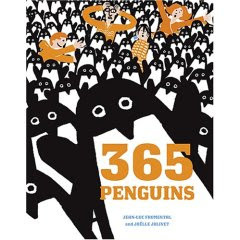 365 Penguins by Jean-Luc Fromental, illustrated by Joëlle Jolivet. Library copy. Picture Book. The Plot: A family gets a penguin a day. It starts out silly and just gets stranger and stranger, as they try to deal with their rapidly increasing household. And who is sending all these penguins, anyway? The Good: Like other titles illustrated by Jolivet, this is an oversized book. The Good: I personally love it, and know kids also like the almost too big size. It also makes it great to use for read alouds. The Bad: librarians weep as they try to figure out where to shelve it. This is a strange book -- the concept being that as the penguins keep coming and coming, the family keeps the penguins, constantly adjusting to the new arrivals. Yet at the same time there is a realistic approach, as the family tries to figure out where to keep them and how to feed them. As the numbers grow, the fun of the pictures increase. One of my favorites is two penguins shown as bookends. What is also fun is to count the penguins; and every time I counted, the number of penguins was exactly right. Along with that is some math goodness. For example, as the family discusses the many penguins it's explained that they now have "four times fifteen" penguins. This sums the book up in a nutshell: "Once you've reached the point of no return, one penguin more or one penguin less each day doesn't make much difference anymore." Links: Pixie Stix Kids Pix review. Library Goddesses Picture Books review. Young Adult (& Kid's) Books Central Blog review.